With iOS 4.0 around the corner, its probably timely to get this post out now. This little post is part of my position paper, “Privacy of Geolocation Implementations”. I’m taking sections out that paper and republishing them here for comment. A website viewed in Safari on iPhone 3.0 requesting to use the end-user's current location. But what will the data be used for? And where is the application getting the data from? As can be seen in the screenshot on the right, when a web page attempts to access geolocation services on Mobile Safari, the browser presents the end-user with a dialog that states “[URL] Would Like To Use Your Currrent Location” with two options: “Don’t Allow” and “OK”. 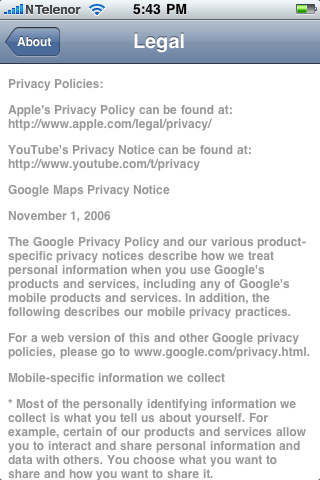 Another privacy issue of Mobile Safari is that the confirmation prompts are modal: the user cannot fully view or interact with the underlying application to make an assessment of what the application might do with the positioning data, without first rejecting geolocation access to the website. Also, it is generally accepted that this kind of modal confirmation dialog lead to ‘click fatigue’: whereby users simply become accustomed to clicking “OK” to every prompt without grasping the consequences of their actions, and without having any real control over what personally identifiable data gets used, what it will be used for, or how long that data will be kept, or even if it will be made available (sold) to third parties. The privacy policies that govern geolocation services are buried three-levels deep in the “Settings” menu of the iPhone, under the “Legal” option, which contains about 50 a lot of pages of legalese and no searchable index! The Iphone 3.0 "Legal" screen does not contain an index. Nor are hypelinks active. Similar confirmation dialogs are found in the iPhone’s native applications (e.g., the Camera and Maps applications). If a user changes their mind about allowing location services, there is usually no way in the application for them to revoke geolocation access without either quitting the application, uninstalling the application, or finding some other convoluted way to revoke access to geolocation services (e.g., having to globally disable location services on the device through the “Settings” menu). What is worst is that once a user grants an application access to geolocation services three times, the system grants access to location services forever – or until the device is “reset”, meaning resetting back to factory default settings. UPDATE: @andreasbovens pointed out to me on Twitter that the iPhone does, in fact, contain a way to reset location warnings. Go to “Settings > Reset > Reset Location Warnings”. My bad. Applications that get granted access then do not generally provide an end-user with a means to revoke that access on an individual basis. This is also true on Mobile Safari: even after clearing the cache, history, and cookies Mobile Safari still grants websites access to geolocation without prompting the user. In summary, Apple’s Mobile Safari browser (and iPhone 3.0 in general) provides end-users with limited access to privacy controls. It also provides no means of seeing which Websites have access to geolocation, nor once granted can that access be easily revoked by an end-user. The OS, however, provides means of achieving confidentiality by allowing the end-user to globally disable location services, WIFI, and cell-tower communication (via “Airplane Mode”). INSERT: The iPhone OS also provides a “Reset Location Warnings” option for all applications.